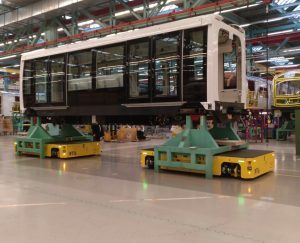 DTA has commissioned 2 units of electric transfer cars of 25 tons each for working either in tandem or single mode for hanling wagons/trains/trams up to 50 tons. This transfer carts got multidirectional steering in order to go underneath a trestle where the wagons are placed. Both transporters are always driven with a Wireless remote control in order to have better visibility when manouvering. The transfer carts do have the option to become AGV on some áreas of the plant where the spaces are very tight. The AGV´s got optic guidance including cameras on each front that will read the tapes placed on the ground.